You have been out to buy your first home. Yesterday, you fell in love with this seemingly fantastic house with an amazing view. After hearing that it is likely to be snatched up any time soon, you hurriedly signed an agreement to buy it WITHOUT any conditions attached. Later, you realised that there are other aspects that are undesirable for you and you wish to pull out.. Can you do this? Unconditional agreement has to be followed by the parties. If the deposit has been paid, the vendor can take it. If the deposit was not paid, the vendor can still sue you for payment of deposit or make you buy the house. In particular, the successful bidder of an auction will be signing an unconditional agreement so it is crucial that the necessary homework is done before making any serious bid at an auction. Visit the house and have a thorough look at the LIM report, the builder’s report and the certificate of the title for the house. We strongly recommend you to seek legal advice as early as possible. Many law firms including us do not charge any extra fee for conveyancing clients who engage the service early on. Despite the fact that you are bound by the terms of an unconditional agreement, there may be a way out depending on the circumstances. 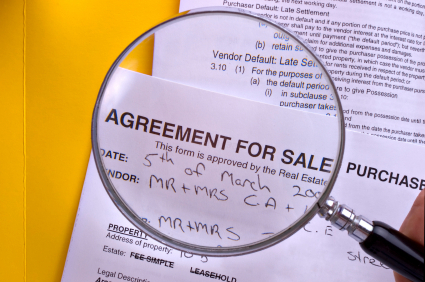 Was there any reason which makes you think that you were induced into signing the contract by any misrepresentation from the vendor or the agent? If the vendor intentionally lied or unintentionally distorted a crucial fact about the house, such as the absence of any leaky issues, you may be able to argue that the agreement is invalid (section 7, Contractual Remedies Act 1979). Think about whether there was any such misrepresentation. Have a look at the marketing brochure or any emails from the vendor or the agent. Since written communications can be useful evidence of a relevant statement, any questions you ask the vendor or agent better be put in writing such as in emails or txts. You may also be able to talk your way out of the mess by having an honest discussion with the vendor since unconditional agreements can be terminated without legal consequences if both parties agree. The real estate agent may assist in the process. If this is agreed to, instruct your lawyer to obtain a written confirmation from the other side to prevent any future disputes. The above potential solutions may not be available in many situations so please take a special care before committing to a purchase of a house which is one of the biggest investments for most people. No information on this article shall be construed as legal advice and information is offered for information purposes only. You should always seek advice from an appropriately qualified solicitor on any specific legal enquiry. PropertyBlogs is the popular online Hub for quality articles. We publish unique articles and share them with our social followers. Take Years Off Your Mortgage? © 2019 Property Blogs. All Rights Reserved.